CGG has started acquiring the Davros 3D BroadSeis™and BroadSource™ multi-client survey in the Northern Carnarvon Basin on the North West Shelf of Western Australia. Covering in excess of 11,000 km2, Davros is the largest seismic survey ever to be acquired by CGG in the Asia-Pacific region. The Davros survey is being conducted by the Viking Vision, using CGG’s industry-leading BroadSeis variable-depth streamer configuration and BroadSource synchronized broadband multi-level source. The vessel is equipped with 12 Sercel Sentinel® RD 2 Hz streamers, the quietest streamer in the market, each measuring 8250 meters. The data will be imaged by CGG using our leading regional expertise and technology including pre-stack depth migration (PSDM). 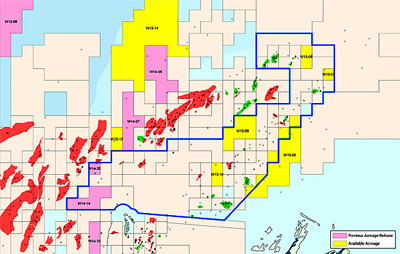 The Davros multi-client solution was designed to best address the imaging challenges of the Rankin Trend, such as the effects of the high-velocity carbonate overburden, steeply dipping structures, fault shadow and structural complexity at depth, all of which is critical for optimal selection of drilling targets in this area. Once complete, Davros will provide the clearest images in the industry of this high-potential area.